Hanoi (VNA) - The Vietnam – Laos Friendship Association (VLFA) will continue to work closely with the Laos-Vietnam Friendship Association (LVFA) to promote friendship exchange activities, thus enhancing mutual understanding and tightening the bilateral relations, said VLFA Chairman Tran Van Tuy. The VLFA Chairman made the pledge during his meeting in Hanoi on March 7 with visiting Lao National Assembly Chairwoman Pany Yathotou. He asked the Lao side to continue creating favourable conditions for the two friendship associations to expand cooperation in the coming time. He took the occasion to inform the Lao top legislator of operation plans of the two associations in 2017, especially activities to celebrate the 55th founding anniversary of diplomatic ties and the 40th anniversary of the signing of the bilateral Treaty of Friendship and Cooperation. The Lao legislative leader stressed that the pure and loyal relationship between the two nations was based on the sacrifice of Vietnamese voluntary soldiers and nurtured by generations of leaders of both countries. She vowed to do her utmost to promote the special bilateral ties. 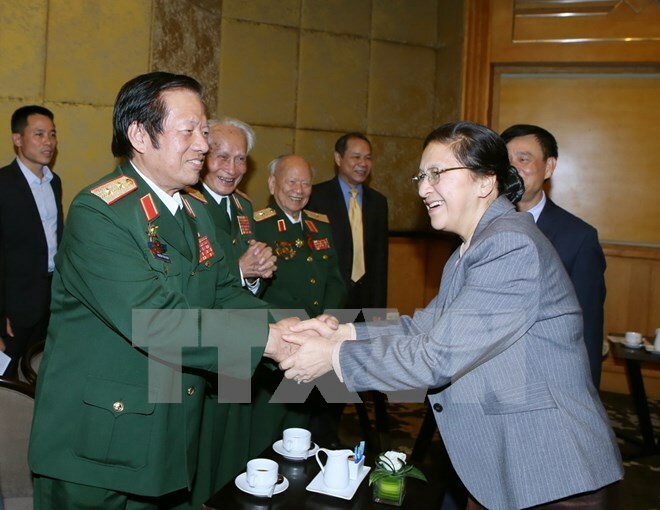 The same day, the Lao NA Chairwoman met with representatives from the National Liaison Committee of Vietnamese voluntary soldiers and military experts in Laos.